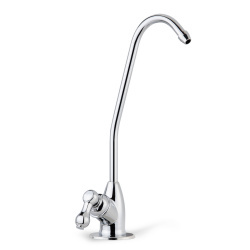 Food grade 304 stainless steel construction ensures heavy duty quality and longevity. Anti-Rust, Anti-Corrosion and Water Spot Resistant. 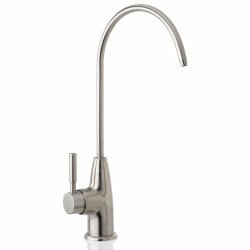 Size: Diameter 1/2" x 9.5"
The lead free 304 Stainless Steel inner tube dispenses safe drinking water thought the faucet. 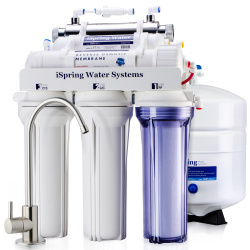 Triple O-rings provide leak free seals. 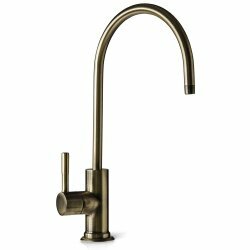 Lead-free stainless coating brass ensures no Rust, no Metal precipitation into the water..
<li>European designer lead-free solid brass faucet. 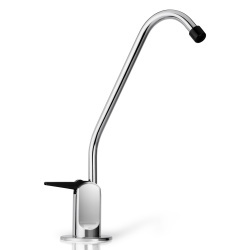 360 degree free swivel <li>Non "air gap" drinking water faucet. 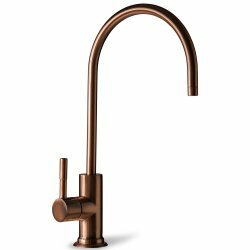 NOT a regular hot and cold water kitchen sink or bar sink faucet <li>Ideal upgrade for undercounter water filters and reverse osmosis systems <li>Antique Wine finish. 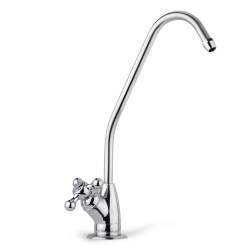 May come with Quick Fitting or Jaco Fitting <li>The front washer is pre-installed underneath the metal plate. 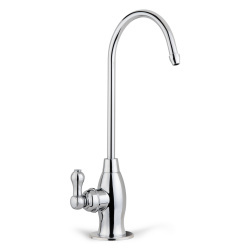 Size: Diameter 1/2" x 12"
An elegant lead-free European style water filter faucet or Reverse Osmosis system faucet will add a great accent to your kitchen. It features a smooth quarter turn handle with a ceramic seat for a lifetime of service. 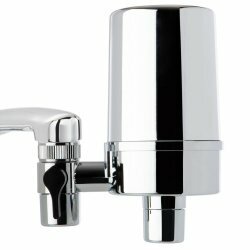 A 7/16'' to 7/8'' hole is all that is needed for the faucet stud (all series), but a cover plate with 1.75 inches Diameter is included to accommodate larger pre-drilled holes. 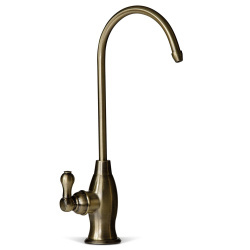 It is 11-Inch tall and has a swivel spout with a reach of 9-Inch. 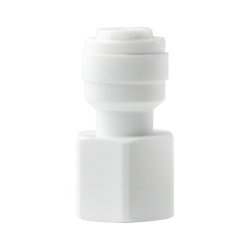 The adapter included in the package is for 1/4'' tubing only. 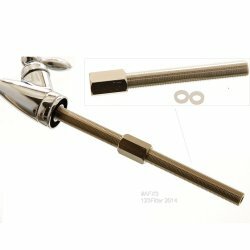 Please contact us if you need an adapter for 3/8'' tubing.Backed by 3-year Manufacturer Warranty with lifetime support line 678-261-7611 from Alpharetta, GA USA. 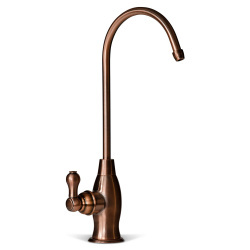 NOTE: Not to be used with RO systems that require an Air gap faucet which has three connections on bottom of faucet. 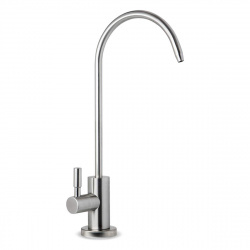 <li>Food grade 304 stainless steel construction ensures heavy duty quality and longevity. 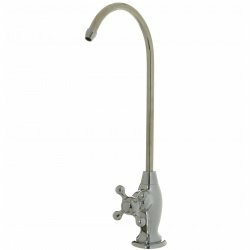 Anti-Rust, Anti-Corrosion and Water Spot Resistant.<li>360 degree swivel spout with 90 degree single lever handle offers easy water control. 9" high-rise spout provides enough space for a variety of sink activities in kitchen.<li>Fit for 7/16'' to 7/8'' kitchen sink hole and connects 1/4'' size tubing. Non air gap RO faucet and cold water supply only.<li>The Package includes faucet, front plate, front washer, wing nut and quick-in adapter. No hose included.